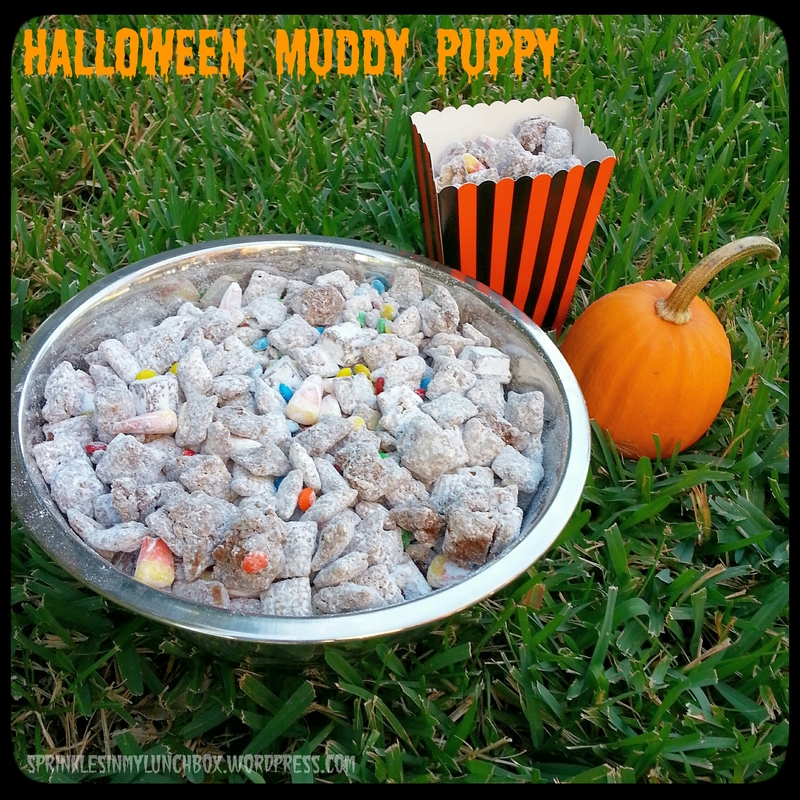 Do you call it “Muddy Buddy” or “Puppy Chow”? I grew up with both names for this dessert. I like them both. I can’t decide which one I want to call it, so for now, I call it “Muddy Puppy”. It seems to work out. 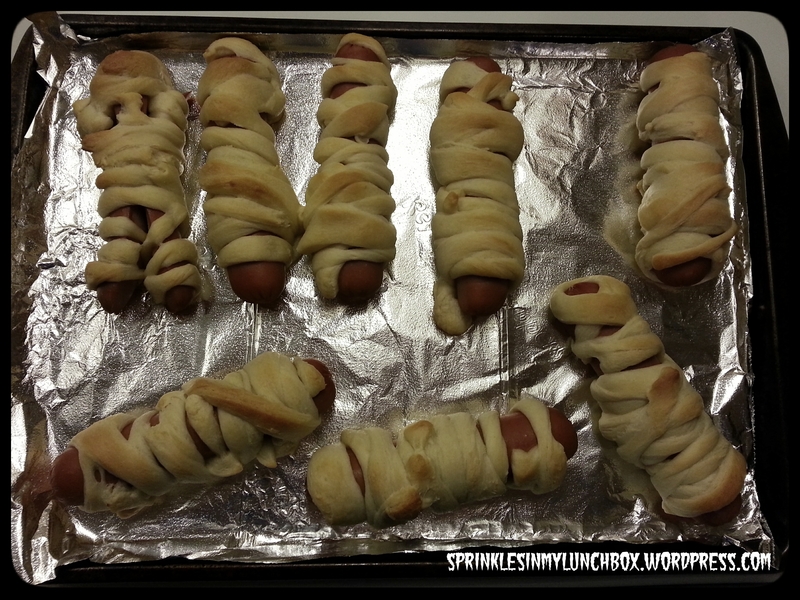 Do you need a quick last minute Halloween party recipe that is sure to please? You’ve come to the right place! This recipe can be made in under 20 minutes (add a few to that to the drying phase) and contains very simple ingredients. And it’s addicting. I’m not so sure that’s a good thing though. Put the Chex in a large bowl. Melt the chocolate chips, butter, and peanut butter (microwave for 1 minute, stir, microwave in 30 second increments to ensure it’s completely melted). At this point, you could add vanilla. Pour over your Chex and stir gently. Place in a Ziploc bag and pour in powdered sugar. Shake shake shake! 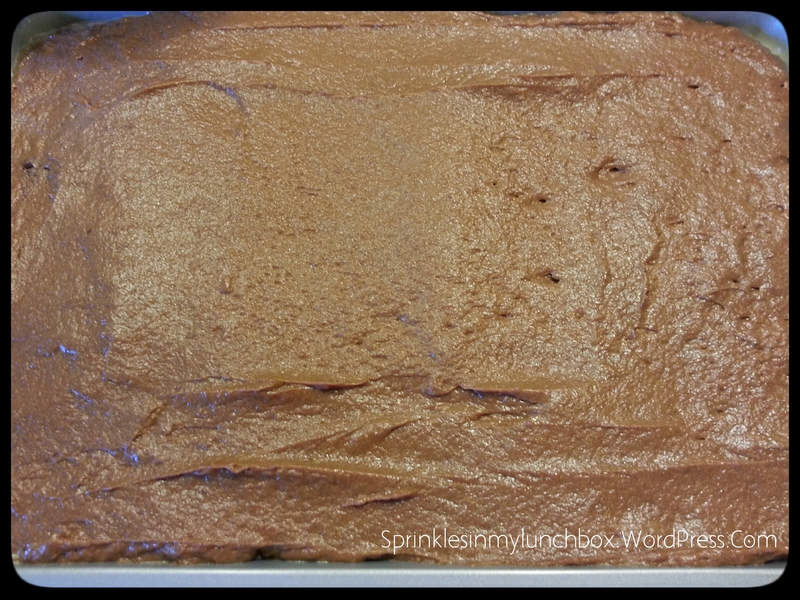 Spread onto a large pan, covered in wax or parchment paper. Dry and cool. Add your candy. 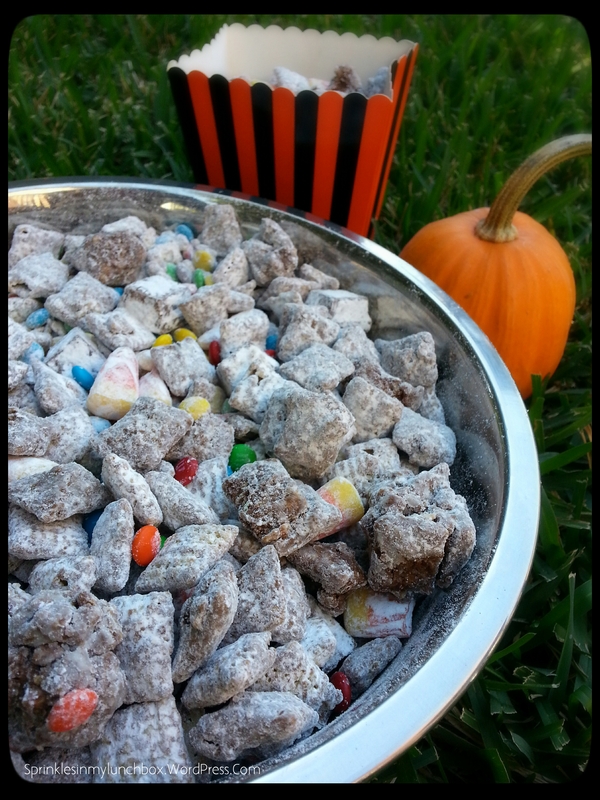 **Caveat: I was in a rush and shook the powdered sugar and Chex WITH my candy. It all tastes the same, but your mix would be more vibrant if you followed the above instructions, which I failed to do. Which is typical. Tomorrow is Halloween. My boys can’t wait. I asked my Bigs what his favorite part about Halloween was going to be and he said that it was the dressing up, “alllll the caaaannnndyyyy”, and being with us. Bless. It’s going to be a fun night. 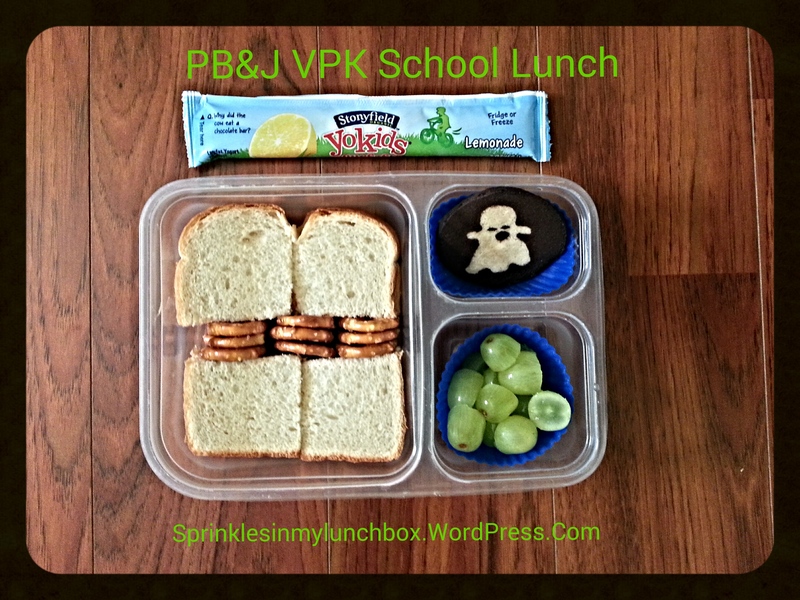 I made a PB&J ghost and used my black Food Writer and candy eyeballs for decoration. I also packed a few veggie chips, some seasoned corn, two pitted dates (or cockroaches, as my kids call them – perfect for Halloween! 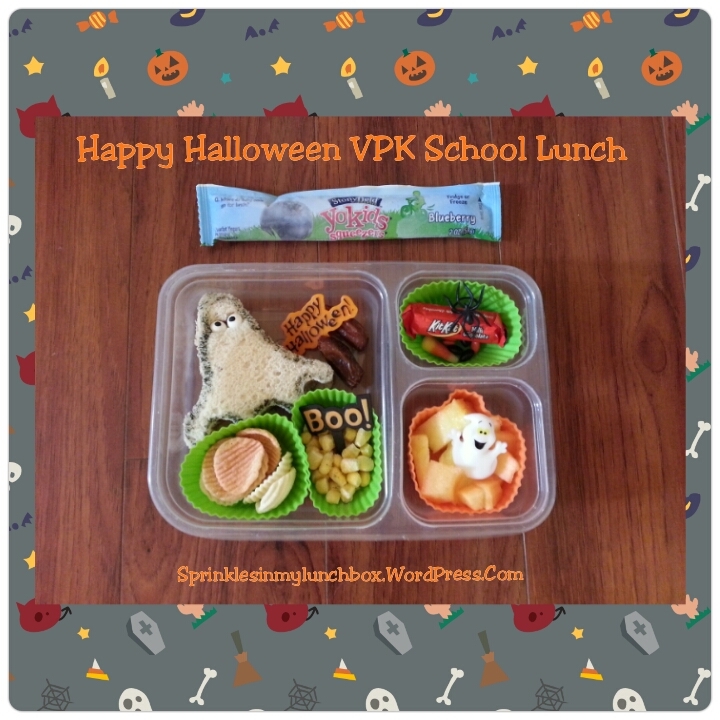 ), cantaloupe and pineapple, a blueberry yogurt squeezy thing, and a few Halloween candies for dessert (a mini Kit Kat, orange and black chocolate covered sunflower seeds, candy corn). 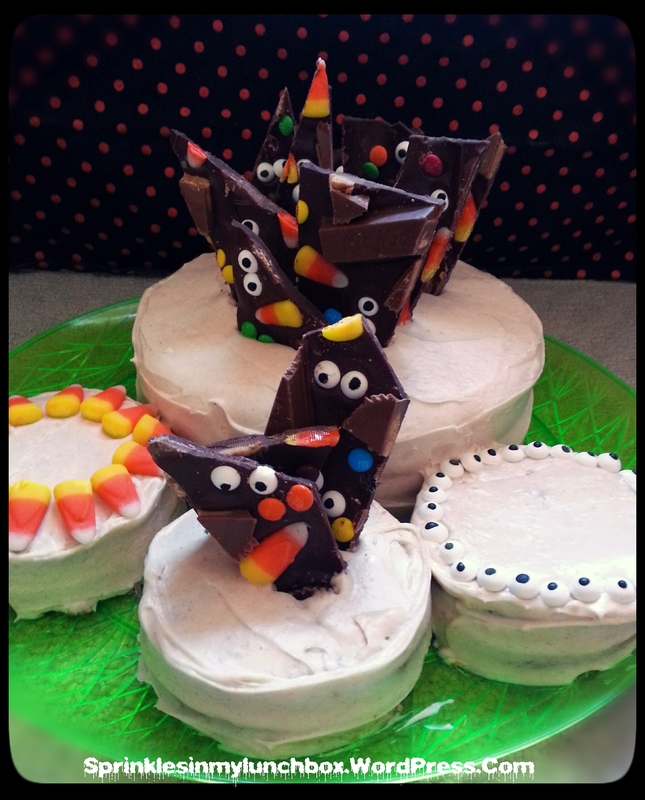 I used cupcake picks and plastic spiders to decorate it all. And tonight, for dinner, I actually cooked something yummy. Everyone liked it. It’s a recipe I used to make all the time. It’s so easy. And cheesy. And trashy. And naughty. And a little embarrassing. I could have eaten the whole pot (almost did, waiting on everyone to get to the dinner table!). Make. Mix. Eat out of pot. By yourself. In the kitchen. I told you it was a bit embarrassing. I also made a treat for my boys’ teachers for tomorrow. It’s more Christmassy than Halloweeny, but I went with it. 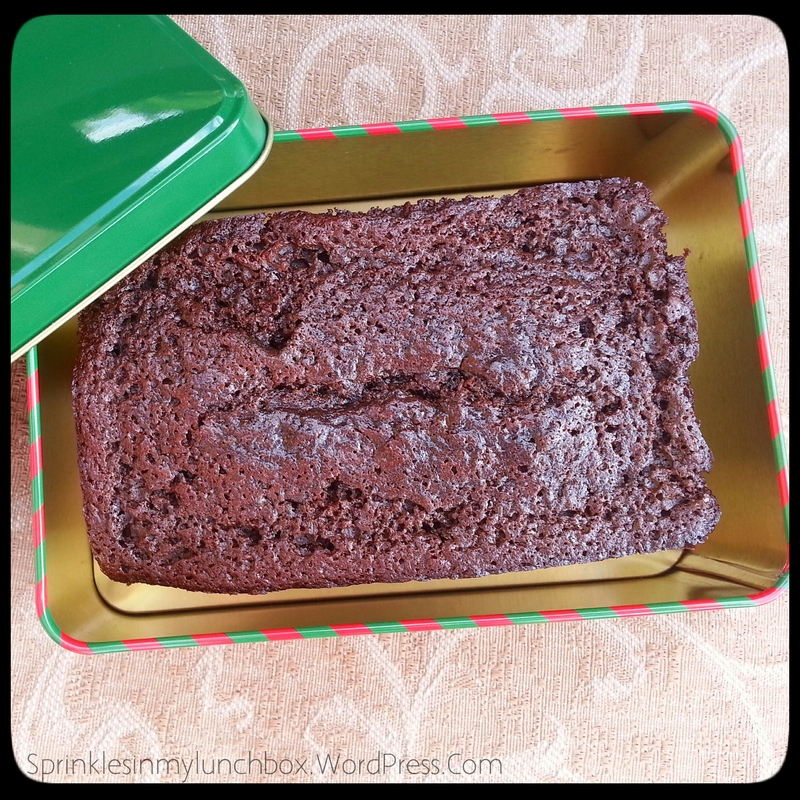 I found a recipe for copycat Jason’s Deli gingerbread muffins, after a recent dinner there with my kids. I am ob-sessed with those muffins (and all things gingerbread). These came out just like those! For the teachers, I baked loaves. It’s moist, tender, but dense, fragrant, spicy, and sweet. I love it. I’ll be making it a thousand more times. I hope you all have a very BLESSED weekend! 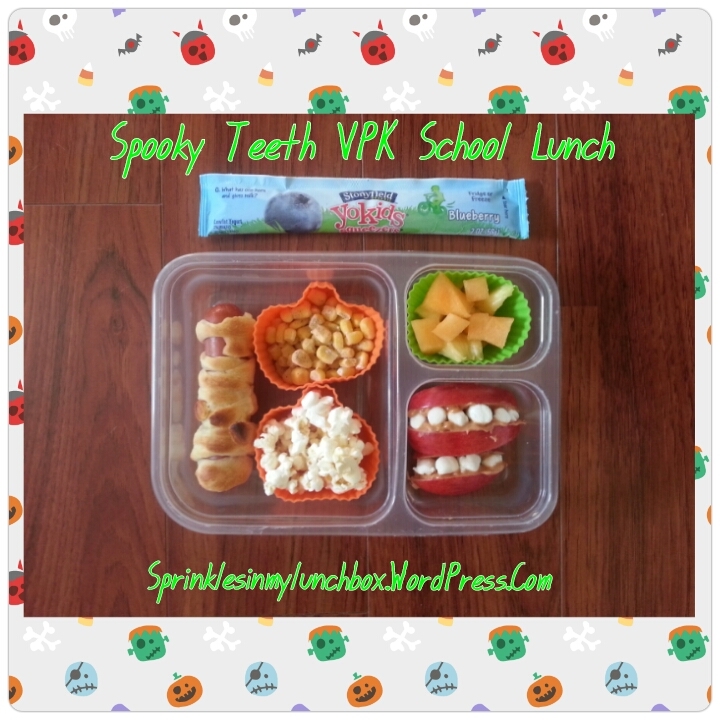 For Bigs’ lunch today, I packed [yes, another] Mummy Hot Dog, seasoned corn, popcorn, cantaloupe and pineapple, an organic yogurt squeezy thing, and some spooky teeth for dessert. These were so easy and will (I hope) make a cute impression. I cut apples to look like lips (they will need some kind of citrus juice on them so they don’t brown), spread peanut butter, and place marshmallow “teeth” on them. Easy peasy. 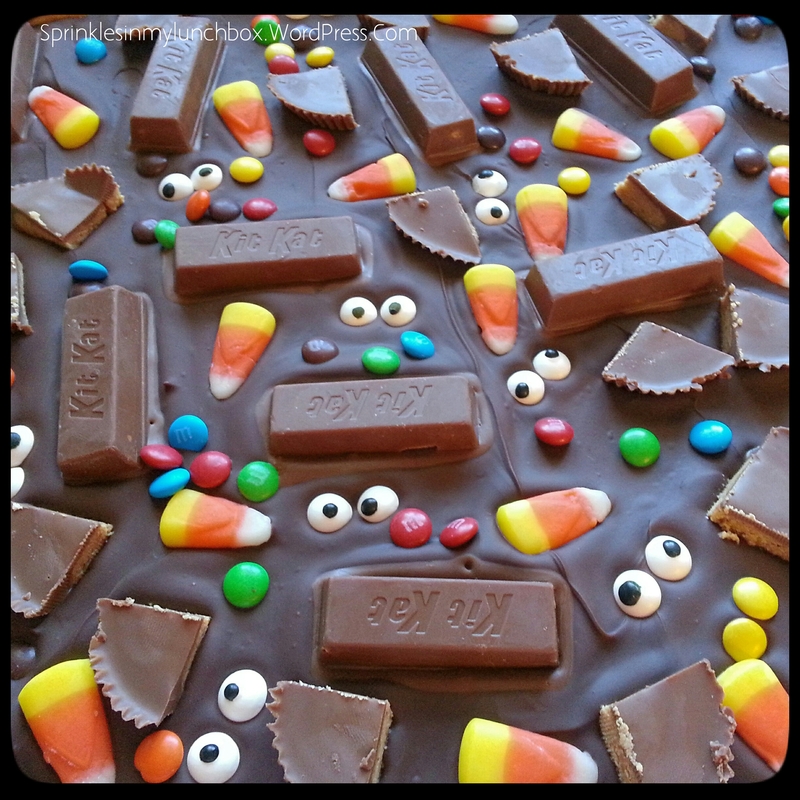 These would be a cute Halloween snack, too! 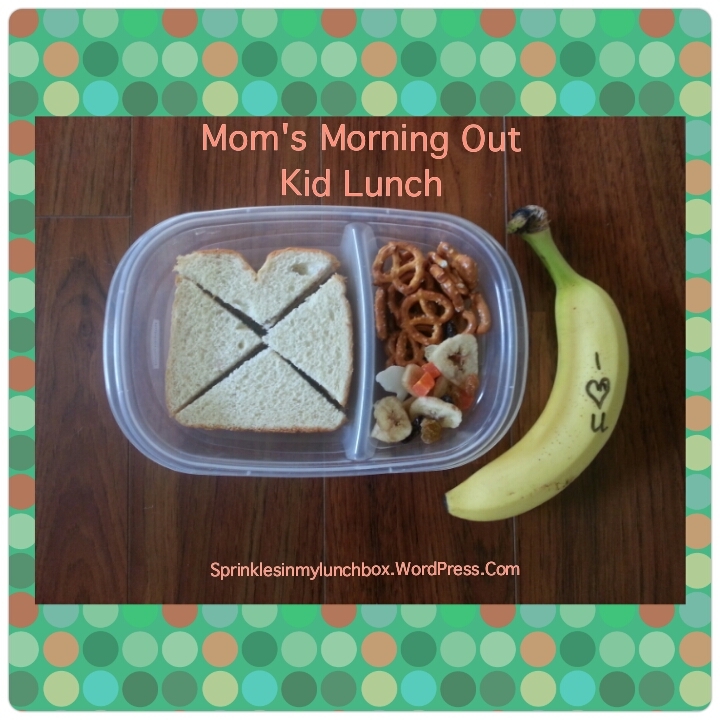 For my Smalls, I packed a PB&J, pretzels, dried fruit, and a banana. The boys are ready for Halloween tomorrow and cannot wait to go trick or treating. My Bigs loved his Mummy Dog lunch today so much that he asked for another one. And, since I made 8 of them (as there were 8 crescent rolls in the canister), I said, “Sure!”. 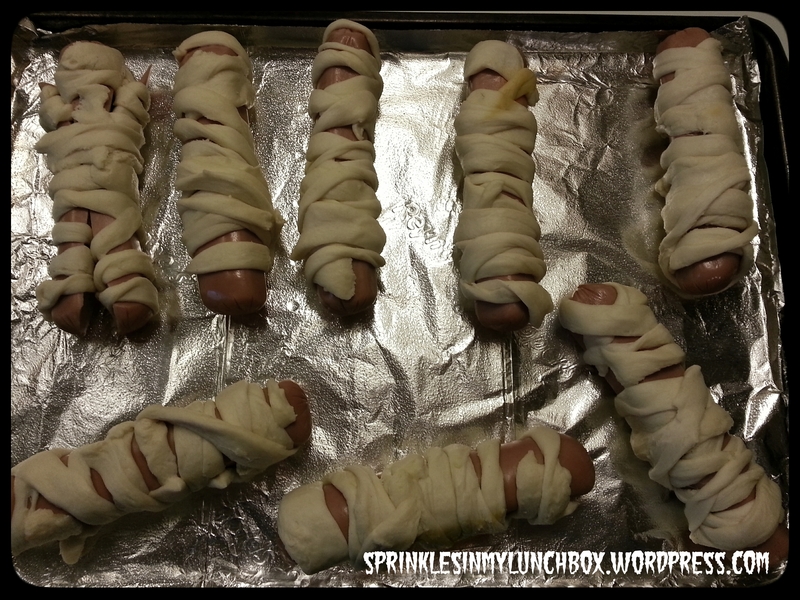 I doubt this is the last day I’ll be making a Mummy Dog lunch, so get ready. 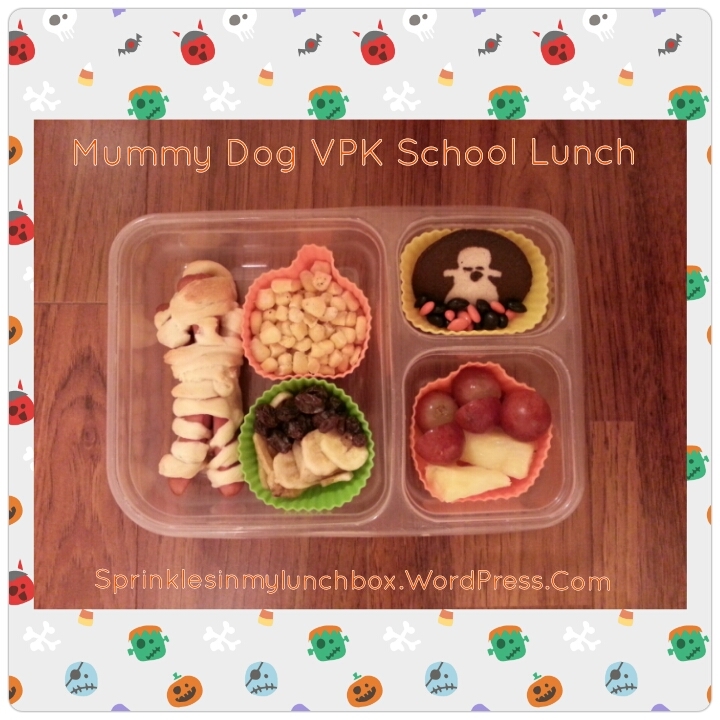 I packed said Mummy Dog, some red grapes, good quality cheese, cut into candy corn shapes, some raisins, a little packet of ketchup (not labeled blood!) for the Mummy, some cantaloupe, and a teeny slice of my Pumpkin Cake with chocolate bark for his dessert. 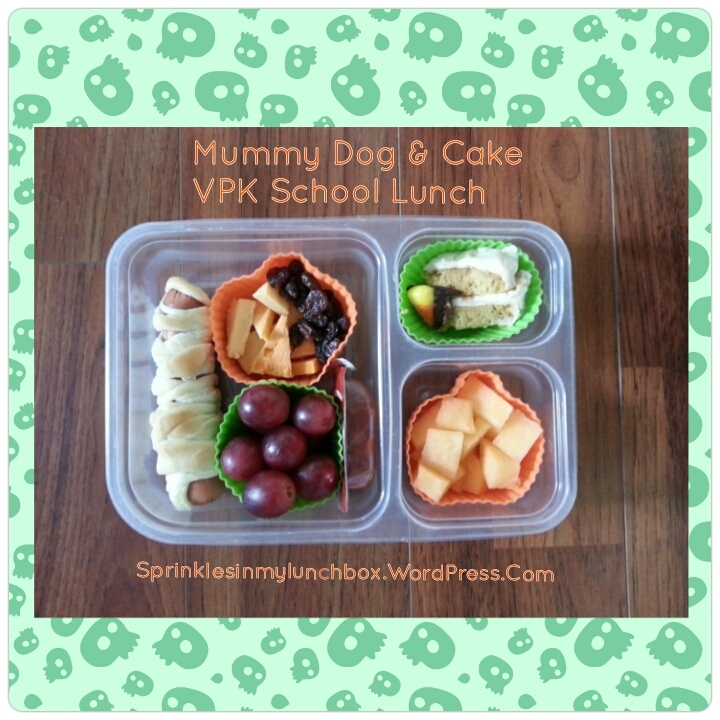 Mummies and Pumpkins and Cakes, oh my! What a fun weekend we had! I participated in my first bake-off. I am SO not competitive, by nature. It gives me anxiety, like, for real. But I LIVE for baking (and you know, my kids, husband, Jesus too). And it was a friendly competition, hosted by my wonderful friend, judged by two chefs that she knew. And I knew we’d ALL be winners, you know, eating all of the desserts. I wanted to do something seasonal, so I decided on a pumpkin cake. To me, that would be perfectly acceptable on its own, because…#pumpkinallthethings, but this was a competition. The cake itself was so pretty. The recipe called for an entire can of pumpkin, which I hadn’t seen before. I knew it would be rich with fall flavor and moist. It was heavenly. 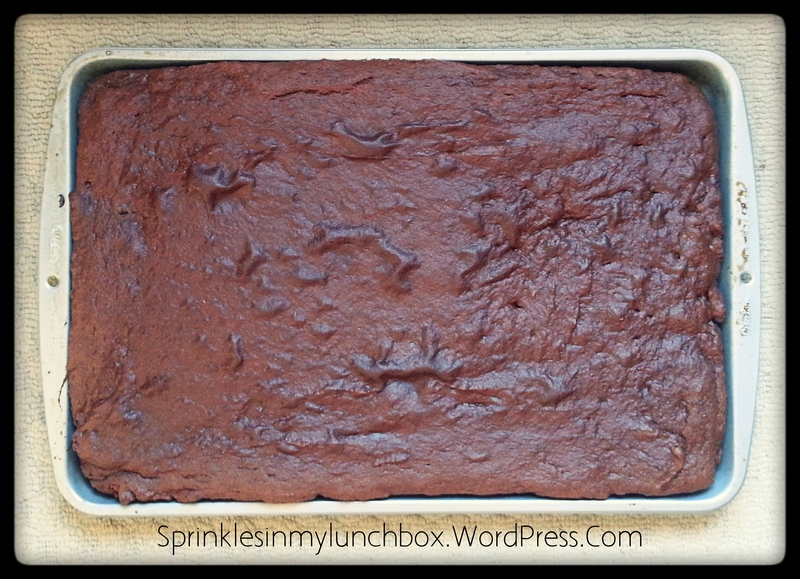 While that was baking, I went to work on next project – the cake’s decoration. 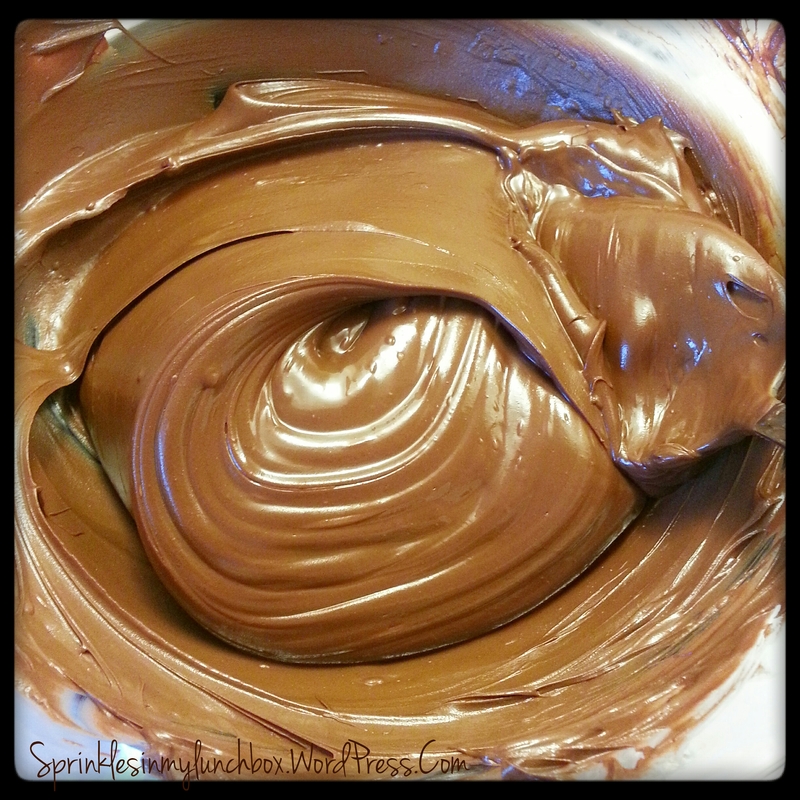 Melting chocolate – isn’t it magical? I meannnnnn, forrealz! This is a thing! I ran across the recipe in my research and fell in love with it. It’s so festive! I could have used any candy, I suppose, but the blog used these and I loved how it looked like the inside of a trick or treat bag, but with eyes. It was so pretty. I can’t even handle how cute it came out. It’s my new favorite. Of everything. Since my pumpkin cake recipe called for 3 8-inch rounds and I only had two, I made three smaller cakes to go with the 2-layered big one. 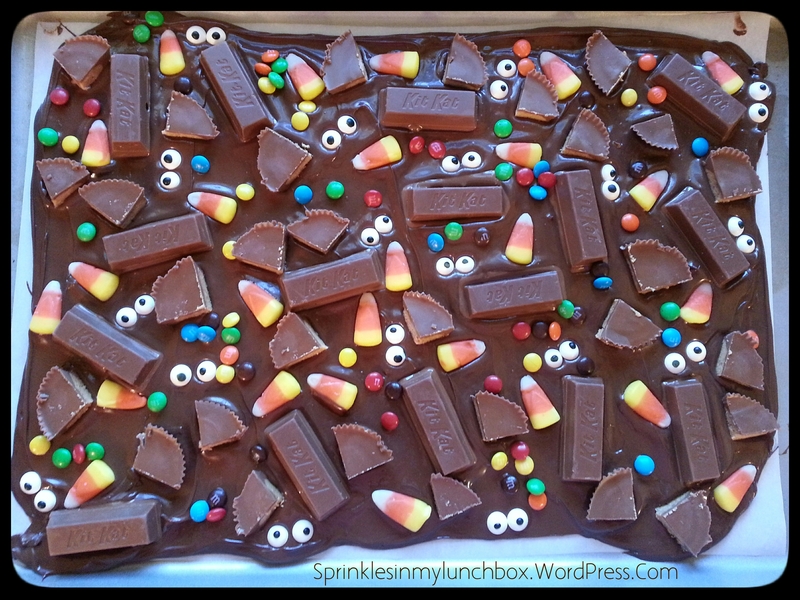 I decorated the big one with the Halloween bark, cut into shards, and I used candy corn, more shards, and eyeballs to decorate the smaller ones. Not the cleanest work I’ve ever done, but it worked out because my creation won “Most Innovative”! I was so happy. It really was a delicious cake (and the bark was SO good). This cake would be an incredible addition to a Thanksgiving table. It’s maple cinnamon cream cheese frosting takes it to a new level. Since my long-suffering husband is both and dairy and gluten free, I couldn’t let him go to the bake-off with nothing to eat. 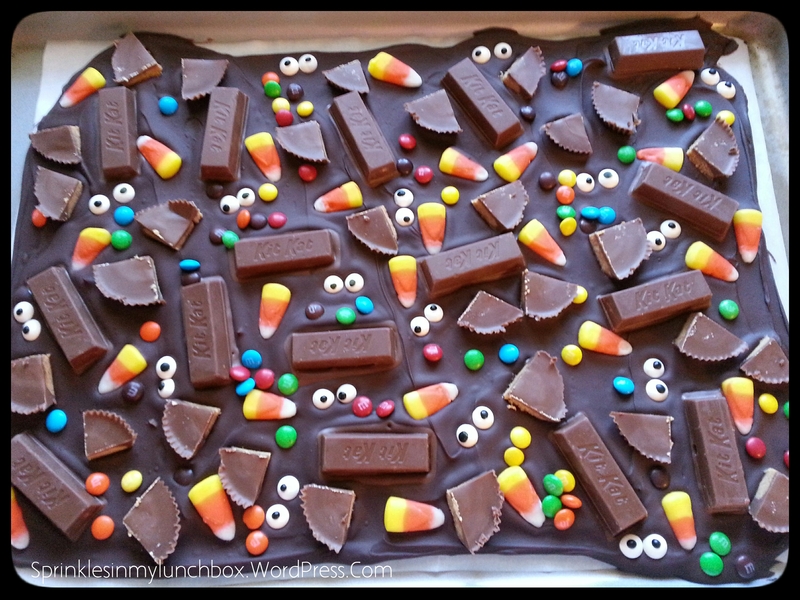 I made him a Chocolate Pumpkin Sheet Cake. I could tell by the batter that it was going to come out delicious. And I was right. It was HUGE too, enough to feed a gluten and dairy free army. It puffed right up like a “real” cake! This was my first successful attempt and GF DF from-scratch baking (cakes). I left off the frosting (since it was filled with dairy). 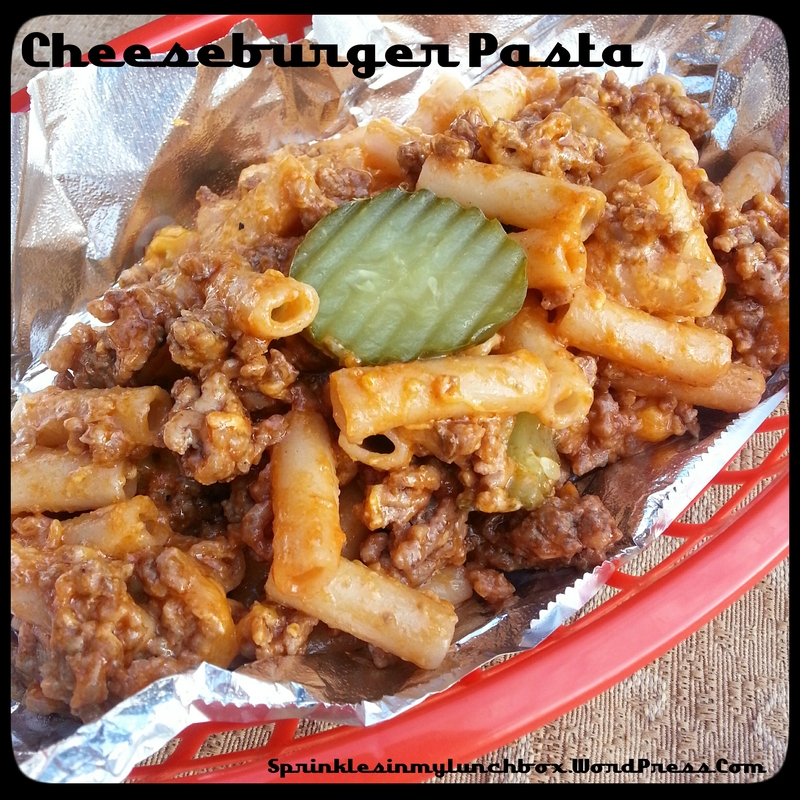 I’ll be using this recipe again and again. It called for over 1 can of pumpkin, but I just used one and it turned out beautifully. 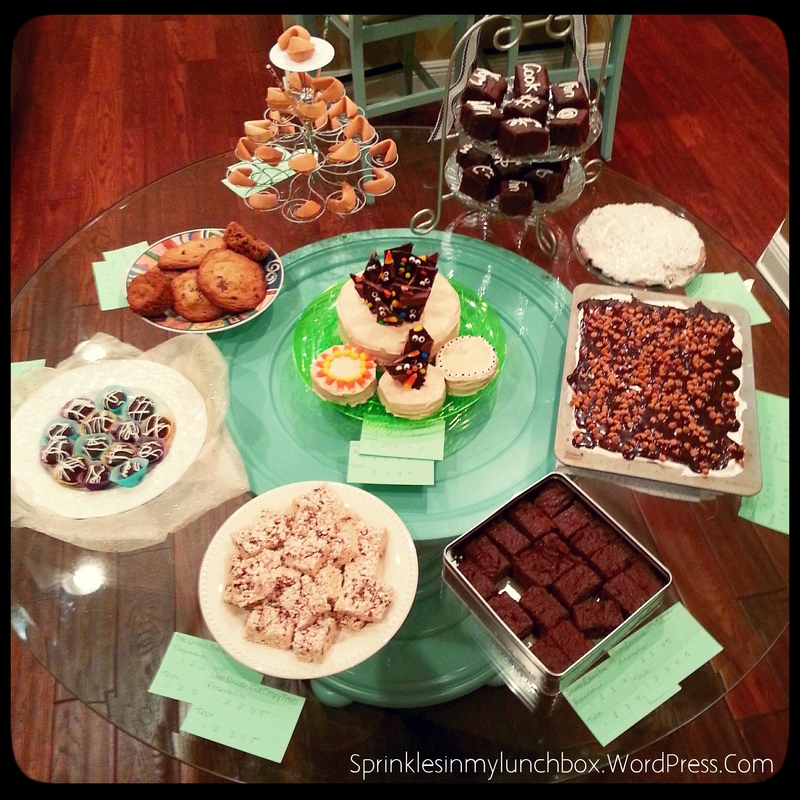 All of the desserts at the bake-off were delicious. That was a fun night. I’ll have to up my game for next year’s competition. 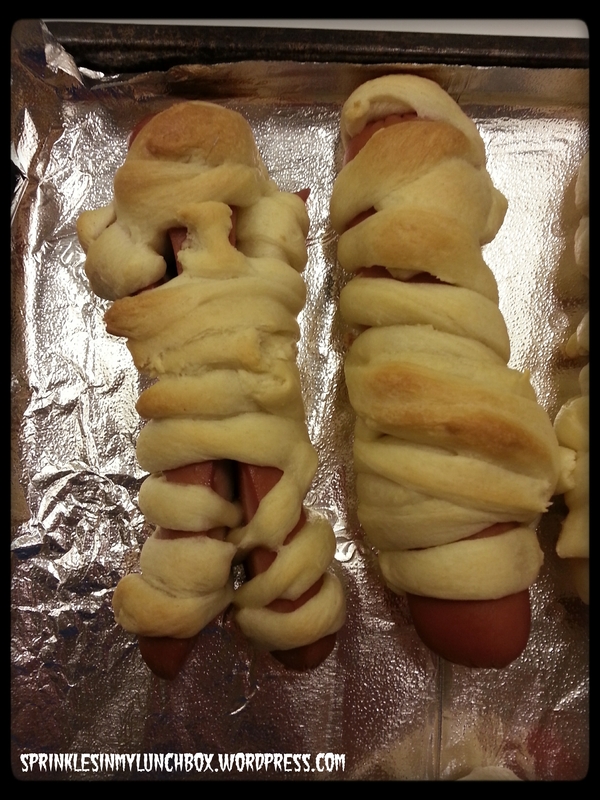 And lastly, I made mummies. Not real ones. Because that’s gross. And unheard of. In these modern times. I’ve made these before (here). They are too easy for words and make a big impact (to kids, mostly, I think). They’d be great dipped in ketchup. But that would look bloody. And grody. We don’t do bloody. Unless it’s a lip or knee. And not on purpose. I was going to make them all like the one on the left, but then nobody had time for that. 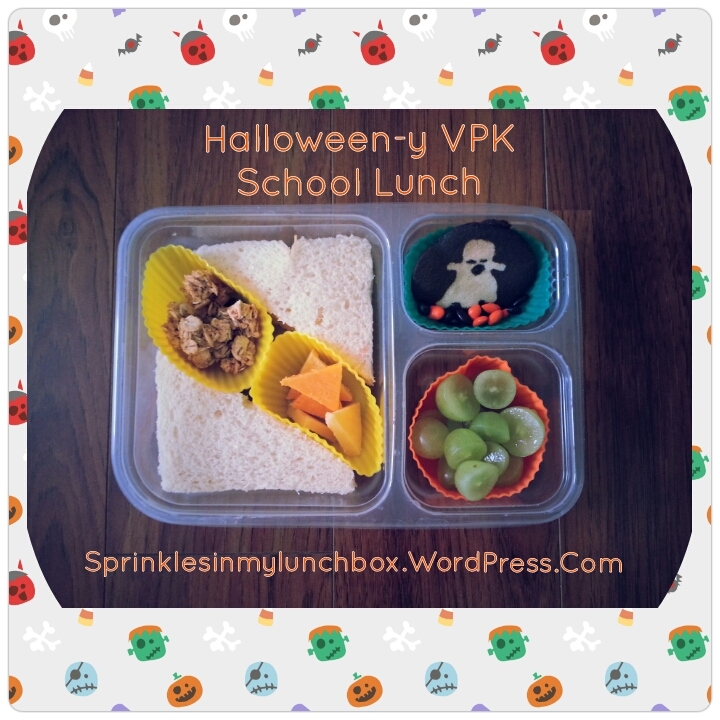 I packed that little guy in my Bigs’ lunchbox, along with seasoned corn, banana chips, raisins, pineapple, red grapes, a Halloween cookie, and some orange and black chocolate covered sunflower seeds. It’s almost Friday! I’m excited, not only because it’s almost Friday, but because we are going to carve pumpkins tomorrow night, as a family. Bigs has chosen an Angry Birds design and Smalls can’t decide between Mickey Mouse and Muno (from Yo Gabba Gabba). I’m going to roast the seeds. We’re going to pretend it’s cold and fall-like outside. It’s going to be great. Also, tomorrow is a book character parade at Bigs’ school. He’s dressing up as Thomas the Train. I can’t wait to watch the parade! Cuteness awaits. I packed a ham, cheese, and mayo sandwich, (more) cheese cut like candy corns (don’t hate on the dairy love! 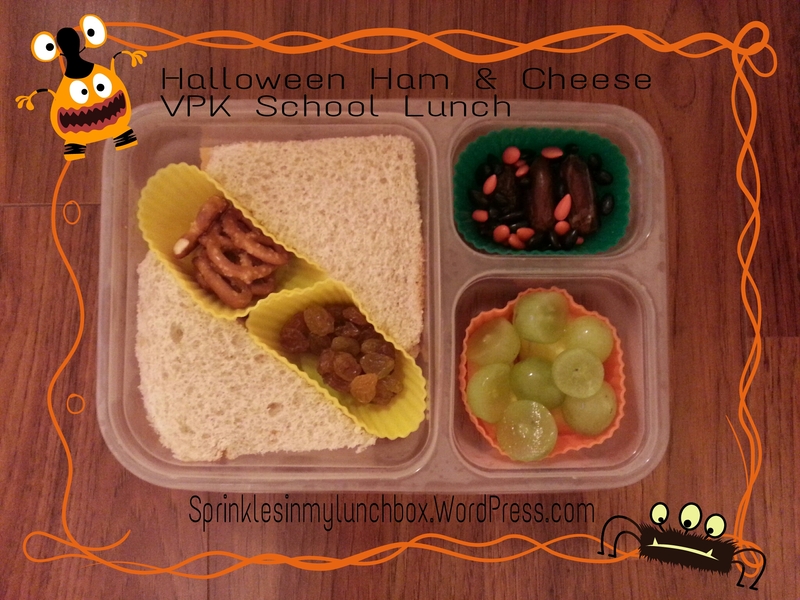 ), granola, green grapes, a Halloween cookie, and orange and black chocolate covered sunflower seeds for dessert. Books. Real live books. The crisp pages. The smell. The rows and rows of newly stacked adventures, waiting to be read. I love books! I am SO thankful that has passed down to my boys. They love books too. We love checking books out at the library and buying books too. This week, at my boys’ school, the Scholastic Book Fair is in town. That was my FAVORITE week growing up. I still have all my old books. Such treasures. I bought the boys some books for Christmas (while they weren’t looking) and we let them each pick out a book tonight. Bigs picked a book called, Creepy Carrots and Smalls picked out a book about a school bus (about which he’s obsessed). Such fun! Bigs also has a PB&J, cut into four squares. I also packed pretzels, green grapes, an organic yogurt squeezy thing, and a Halloween cookie. I’m going to tell you a bedtime story. Today has been a pretty good day. Which is weird, considering the amount of things that were a little “off”. It started well enough. My Bigs and Smalls slept in (passed 7 woo-hoo! 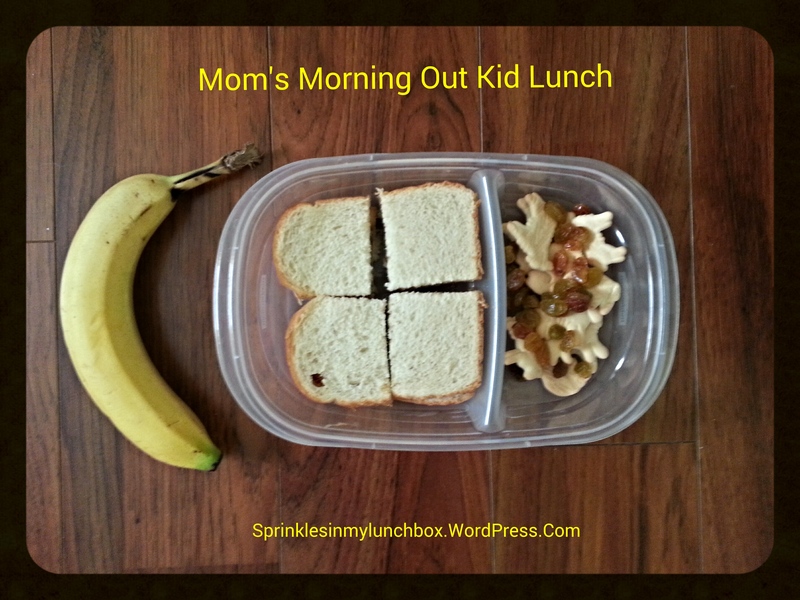 ), I had dinner cooking in the crock pot by 8 a.m., Bigs went into school without a hitch. Then things started going wonky. My Smalls and I were meeting a friend and her littles at Walmart (because Walmart is better in pairs – strength in numbers, people!). At Walmart, I bought baking supplies for my upcoming bake-off. And since I only had a stroller with me (because…Walmart carts), my bags were flying all over the place. My 4 pound bag of sugar fell out of its Wally bag and landed with a thump on the floor. A nice construction worker, who was walking by, picked it up for me. I didn’t think twice about the incident. My friend and I said our goodbyes. 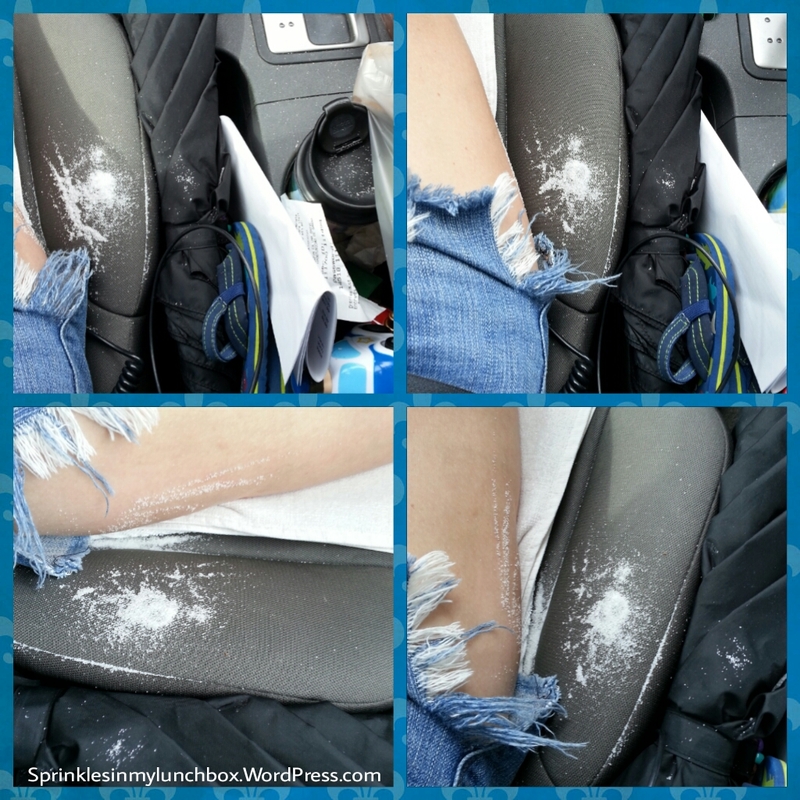 Once in the car, I reached over to get my Smalls a snack, with the sugar bag IN the Wally bag in my hand, and felt some sugar pour, ever so gently, on my lap. I lifted the Wally bag, only to find that, indeed, my 4 pound bag of sugar had opened and the darn Wally bag had a hole in it. My lap and entire front seat (passenger side included) was covered in sugar. We high tailed it to a gas station to use their vacuum. I only had four quarters and a prayer. The machine (only accepting quarters) was $1.50. We went to another station, only to find that it cost $1.25. We drove home, a city away. By that time, my sweaty self had managed to make a simple syrup with all that sugar in my lap. I’m not even stretching the truth at all. I could have made you a Mint Julep if I’d had the mint. Anyways, when we finally arrived at home, I used my husband’s shop vacuum, which spewed whatever was in it all over me. Natch. During my cleaning, I found a quarter. Of course. And once inside, I found that I already had sugar. Soooo….that all happened. But you know what? Through all that it was still a good day. I was able to laugh at my day, because it WAS quite comical. Life is messy. So was my day. But it was still good. I had more positives than negatives. Dinner was ready. The kids had a good time at Wally World. Bigs had a great day in school. I had great fun with my friend. It was all good. Sometimes, you just have to focus on the good. I have extra sugar now. My truck is cleaner than it was. It still has baby flipflops and a million umbrellas (and probably some sugar granules), but it’s [mostly] clean (on the inside, anyways). And, I went on a very sweaty and messy, but sweet, adventure. Isn’t that life? One big, (sweaty, for me) messy adventure? This picture doesn’t even do the amount of sugar justice. It was bad all over the place. It’s aiight. I’m a big girl and I managed. Tomorrow’s a new day! He’s got a ham, cheese, and mayo sandwich, pretzels, golden raisins, pineapples and green grapes, and for dessert, pitted dates (or cockroaches, if you want to go that route), and orange and black chocolate covered sunflower seeds. I’m not even going to hide the fact that my toilet is dirty. That’s how we roll in my house. 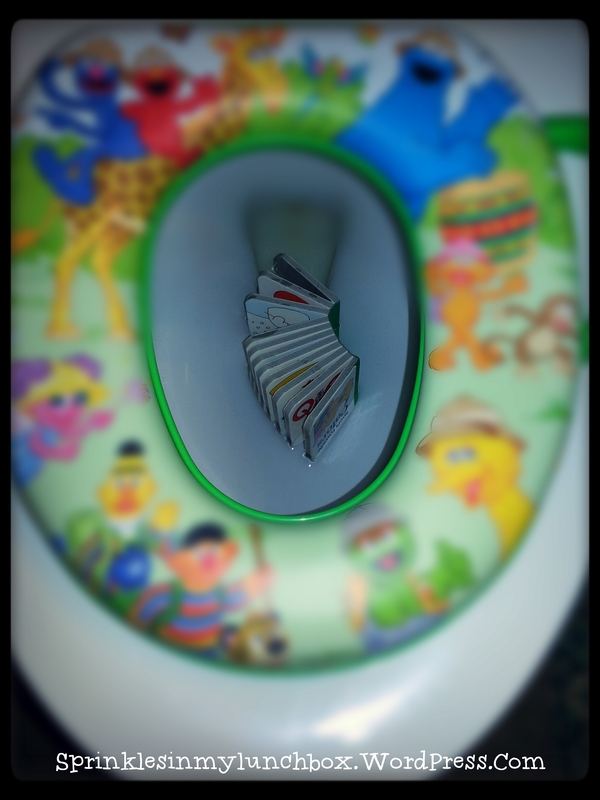 My Smalls was “going” and I gave him privacy only to hear, “Mommmmmyyyyyy, my boooook is in the toy-yet!! !” That’s life. Life is messy! Y’all, I am a hot mess. Literally. I am hot all the time (if you know me in ‘real life’, you know) and I am literal mess. I’ve either got someone’s food smeared on me or someone’s pee saturating my clothes. Like everyday. And I re-wear clothes. Like all week long. The same clothes. It’s gross. I’m gross. And when I go to bed at night, I haven’t always had a #Mommywin day. Some days are really hard. Most days, actually. But I learn from them. Mostly. I’ve learned a LOT in my almost four and a half years of being a Mommy. Probably more in that time than all the rest of my life put together. And I’m still learning. I don’t think one stops learning. I’ve learned that not every day is perfect. That I’m not perfect. And my kids aren’t either. Although fearfully and wonderfully made, they are professional mistake makers. That’s what they do. They will learn. And continue to mess up. Just like me. I, too, am fearfully and wonderfully made, and I am messing up daily. And that’s okay. I’m learning that it’s okay to mess up. Kids, in general, are incredibly forgiving. When I have a bad day, we start over in the morning. While that is hard when you are still wounded by things they say and do, it is a blessing when you’ve had a crummy day as a parent. Something we should remember and practice, ourselves. Likewise, God’s mercies are new each morning. Remember, He made us out of dust. He wants to love and protect what He’s carefully made. He, too, lets us start new. I’ve learned the value of fellow Mommy friends. During my first year as a parent, I was pretty isolated. I didn’t know many other Moms nor did I venture out much. Target was my outing of choice (still is HA!). When my Bigs was almost one, I joined a kids’ gym, and met my first group of Mom friends. It changed my whole life. It took me out of my comfort zone. I finally had people that understood my daily struggle! Then I joined a Mom group in my church and my friend groups, faith, and fellowship grew even more. I am constantly meeting new friends through both of these groups and am so blessed by each Mom that I meet. Each one has something new to teach me. And I am hungry to learn. To soak up those bits of knowledge that have been imparted to me. I’ve learned that it’s okay to let your child fail sometimes. It’s so hard, as a parent, to sit back and watch your child hurt. And it’s equally hard, as an extremely Type A personality, to watch my child do something “wrong”. I’m learning that it might only be “wrong” to me. My boys have taught me (without trying) that there are more solutions and different ways of looking at things. I’ve learned the value of community. Accepting the help or advice from my fellow parents has been such a valuable lesson for me. Surrounding my children with strong and faithful families has not only strengthened my own faith, but my children’s (without them knowing). I am learning patience. Apparently, I was not born with it and didn’t develop it very well, despite thinking that I wasn’t THAT much of an impatient person, prior to having children. It’s a struggle, y’all. Oh, the struggle! I am learning to let go. There are so many things that I could hold on to, that just don’t need be be held on to. And to let go of the control I keep trying to have over all the details of my life. My God is huge, my God is awesome, and my God is in control. As always, I am a HUGE work in progress. Every day, in some way, I’m learning something new, about myself, about Motherhood, and I’m asking forgiveness for my mess-ups, which are frequent. I am not perfect, nor do I want to be. I just want to be the Mom God made me to be. 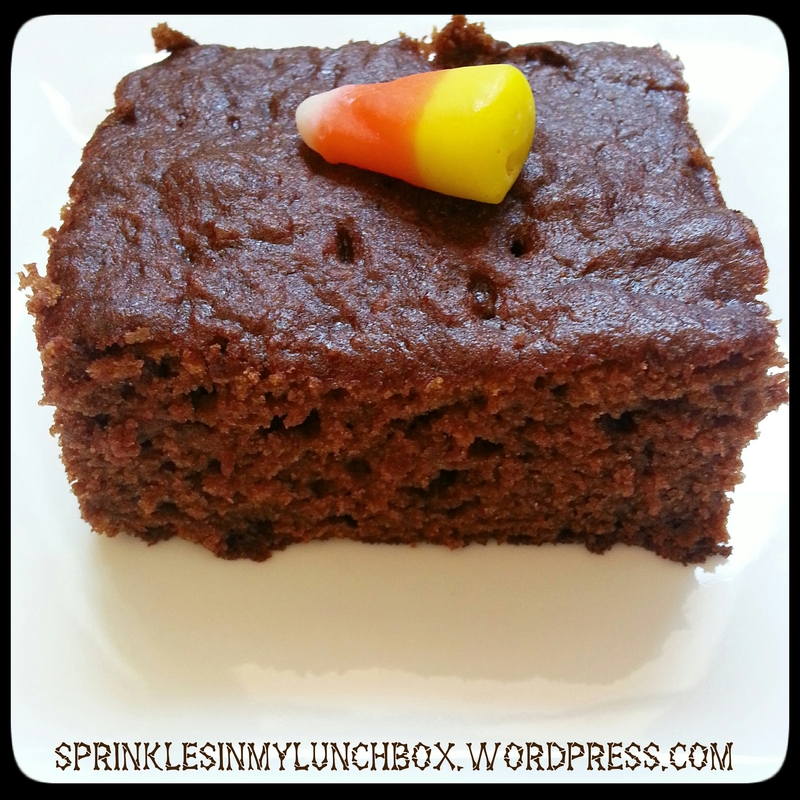 Happy 1 Year Blogiversary to Sprinkles in my Lunchbox! Please “like” my Sprinkles Facebook page!